Leave it to a mom to steal a kid's thunder - but strictly in a good way. The "kid" in this case was 26-year-old Sun Xiangxiang, who completed his trifecta of International Boxing Federation regional titles by capturing the IBF Asia lightweight crown with a unanimous 10-round decision over Roldan Aldea of the Philippines on Saturday night at Xiedao Resort in Beijing. It was a shining moment for Sun, who improved to 15-0 in adding the golden strap to a collection that already included the IBF China and IBF Belt & Road titles. Still, the biggest cheers at the eight-bout Silk Road Champions tournament card were reserved for Huang Wensi, a 29-year-old southpaw from Ningbo, Zhejiang province, who punched her way to a surgical eight-round decision over Russia's Snezhanna Tsarikaeva in their bantamweight elimination clash. Huang, a late substitute for Georgia's Sopo Kintsurashvili, is China's first - and only - pro boxer who is also a mother. With her two-year-old son watching from ringside, she used a piston-like jab and superb footwork to up her record to 10-3-1, earning scores of 80-72 and 78-74 (x2) from the three judges. 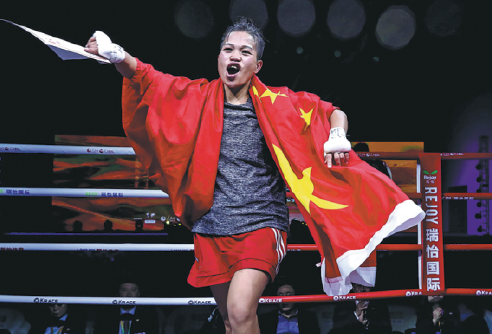 After her powerful right fist was raised in victory, Huang flashed a huge smile and cut loose with an impromptu dance in the middle of the ring, igniting thunderous applause from the crowd. "I don't usually dance like that; it just happened because I was so happy to win in front of all the fans - and especially my son," Huang said afterwards. "Being able to do well in the IBF Silk Road tournament means a lot because if I continue to win and advance, I will get more opportunities to fight foreign opponents and hopefully bring glory to China and to my hometown." Huang first laced on the gloves at age 11 and turned pro at 16. She married in 2013 and took a four-year break from boxing before returning to the ring last year to mark her son's first birthday. "I was kind of a naughty child and wasn't always well behaved, but then I started boxing and learned about discipline and respect," she said. "When my son was born, I knew I wanted to pass on those lessons and give him a gift from my career. That happened in September when I won the golden belt as the WBC Continental super flyweight champion. Now I want to win an IBF title." Asked which is tougher, being a mom or being a boxer, Huang said it's no contest. "Boxing is very tough, but you train for it. It takes a long time, but you train and get better. There's no training for being a mom. It's something you have to learn very quickly. There's no time to really think about it ... you just love your child and do the very best you can." Saturday's card was the second stop of the IBF Silk Road Champions tournament, which kicked off its second edition in Macao in August. Last year the IBF became the first global sports organization to integrate the Chinese government's Belt and Road Initiative into a highprofile competition series, incorporating the 60-plus nations in Asia, Africa, the Middle East and Europe that are participating in the Silk Road Economic Belt and 21st Century Maritime Silk Road. "We created a ratings system that allows fighters to be assessed by the B&R ranking committee and is published quarterly," said IBF president Daryl Peoples. "The champions and top contenders from each country are listed by division and qualify for our world rankings. "Our aim is to use the annual tournament to stimulate boxing's growth throughout the region by providing a platform for fighters to develop their pro careers and for promoters to produce quality events for the fans. "We're in it for the long haul. And in the spirit of President Xi's desire to foster harmony among the nations participating in the Belt and Road, we hope to eventually expand beyond boxing and embrace other sports and social initiatives in the participating countries." QUICK JABS: Three Chinese fighters were undercard winners on Saturday: Lightweight Aketelieke Jieensi of Urumqi UD10 over Rimar Metuda of Australia; light heavyweight Nuerzhati Abulimiti of Urumqi UD4 over compatriot Huang Lijian of Hefei; and junior middleweight Kenbati Haiyilao of Beijing MD10 over Karen Tevosyan of Russia ... IBF Asia female featherweight champ Hu "Butterfly" Die of Zhuzhou (8-1) is now ranked No 9 in the world.